Playing sports is good for kids in all kinds of ways. It gets them off the couch and helps them get or stay fit. It helps them develop physical skills as well as social skills, such as getting along with others, being part of a team and practicing to reach a goal. Children should play with and against children of a similar size and skill level. Many youth sports are divided by age or grade level, but there can be huge differences in size and development among children of the same age. Usually there are different levels of a sport, such as an instructional league, a basic league and an elite league; there might even be multiple levels within each level. Children should be placed appropriately, so that they are reasonably competitive with the kids they are playing with and against. Children should start conditioning before the season begins. Especially as children get older and play in more competitive leagues, it is important that they get in shape before the season. Kids who are better conditioned are less likely to be injured. Be careful of overuse. Common overuse injuries include arm and elbow injuries for baseball players, especially pitchers, and leg injuries for athletes in sports that involve a lot of running. Understand the league’s philosophy and the coach’s own personal philosophy. Then monitor the child. A child who is complaining of pain probably should rest. If the pain is significant or does not go away with rest, check with a doctor. Children should stretch and warm up fully before exercise and cool down afterward. Warm-ups and cool-downs should be part of the coach’s regular routine. Children should have sufficient water breaks. That is especially critical during hot weather, but it is important at any time. The academy recommends that there be scheduled water breaks at least every 20 minutes. The pediatricians also note that plain water is usually sufficient for hydration. Children should use the right equipment. Children should not have to “grow into” their equipment, including shoes. It is important that shoes and equipment fit properly and be well-made and appropriate for the size and skill level of the child. It isn’t necessary to have the most expensive equipment available, but the child should be able to handle it easily, and it should stand up to the child’s level of play. Also, there is a lot of discussion about whether children play too many sports or specialize too early. Most experts urge parents or grandparents to take the cue from the children. If they are enjoying the sport, feeling good about themselves and not complaining about injury, the benefits probably greatly outweigh any potential issues. 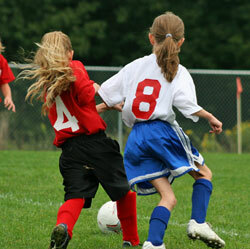 However, experts say that children should never be forced to play a particular sport. Finally, the job of the adults in the child’s life is to support and encourage. Of course you celebrate when the child wins or does well. But you can also help the child learn from difficult experiences. Help the child see the importance of trying, of working to get better. Remember – and remind the child -- that it is a game, and that the opposition also is trying hard. And demonstrate the good sportsmanship you want the children to learn. Never, ever berate any of the players, coaches or officials.